So that's chicken curry, is it? I can't see much evidence of any chicken! Congratulations on your firsts in the long run and sprint, Veg. Hi Veg, I'm a Brazilian journalist that works for Vida Simples (Simple Life) magazine. If your dad agrees, would you mind if I sent you some questions about your blog? We want to write an article about what you're doing and the changes it caused. My email is diogoarodriguez [at] gmail [dot] com. Thank you and congrats! Veg, I did a post on my blog about NeverSeconds. Hope you like. And congrats, it's an amazing idea. What you're doing is great, I hope that other kids do the same. I'm really enjoying your blog and sharing it with my daughters, ages 8 and 6. 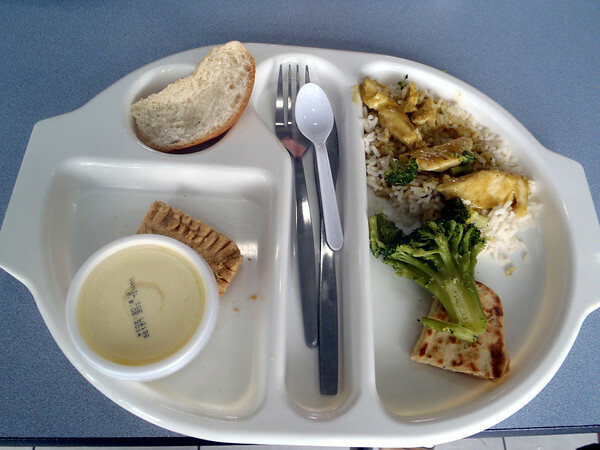 We always have a nice discussion about what we like/dislike about the lunches in your pictures and how they differ from our American school lunches. We buy school lunches only one or two days a week for convenience and pack the other days. I am not a big fan of the junk food served on most days. I would love to see more packed lunches from different places! Hi! I've been following your blog since joanna at cupofjo posted about it. I think your idea was fantastic! I'm a 22 year old reader in the US. I was homeschooled, so school lunches kind of fascinate me. lol Keep up the great work! I could have predicted that the amount of chicken would be modest, but ONE piece of broccoli? Good Heavens. If I were in charge of your lunches, you'd be getting much more broccoli than that, believe me. And often. Actually, I'm okay with the amount of chicken. But I do agree that one little broccoli stem (looks like most of the florettes have been cut off), hardly qualifies this lunch for a 7 out of 10 ten "health rating." Again, there are a lot of essentially nutritionally empty starches. Rice + bread + naan. Add in the shortbread and ice cream, and this lunch is mostly starch and sugar. I do understand that Veg had the option of fruit and chose not to have any, but -- as is -- I would give this a "health rating" of about 3. Remove at least one of the starches (why do you need bread if you already have rice and naan?) and double up on the vegetables and I would have felt a lot better about the nutritional value of this lunch. Glad you had a god sports day. I'm from Germany and today there was an article of your Blog; great idea, nice posts and I hope your lunch tastes better soon. 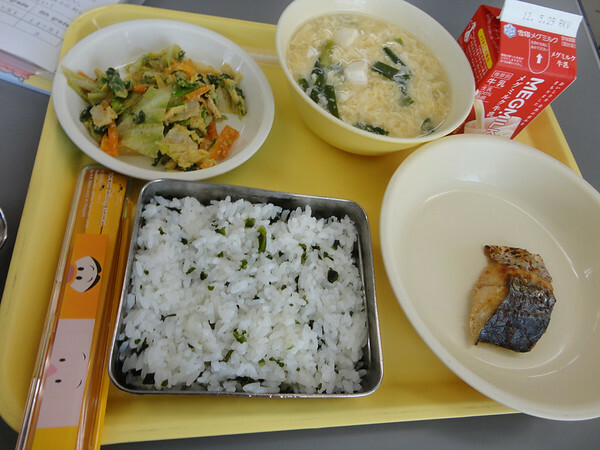 Hi,You Know Japanese Lunch Box ? I have had a nice read of your blog - but im confused by a few things and I think it would really benefit if you had an FAQ page. What are the coloured bands for? What are the seconds after you name a place? The colored bands denote Veg's menu selection for that day. She is from Scotland. Considering that she is a 9-year old girl, that's really about as specific as anybody needs to get. Very nice blog :) there was a short article about it in a Finnish tabloid magazine and that's how I found my way here. You have a very nice and fluent way of writing and it's extremely interesting to read your posts. Finnish students always say the food in our schools is bad or below standards which in most cases it isn't. When I was in elementary school my favorite weeks were the ones when we had a country themed menu. That meant that one day we had Chinese food, the second Mexican etc. Keep up the great work! Greetings from Helsinki, Finland. Brilliant idea... Children from all schools should be able to rate their meals, to keep the quality and variety up. I would urge you and others to keep it up. As a parent it's nice to see what children are being served although there are some disasters posted there are some pretty good meals which you have rated positivley as 10/10. As adults we rate our meals an have no issues complaining in resturants if the food is not to a good standard and we prais the chefs when it's good. So why can't Children have their say? They are the customers and they have to consume what is provided. They have a responsibility to care about what they eat! Pretty sure you will not find many Indian meals. Most Indians carry packed lunch from home. Mostly two pieces of chapati or a single man bread, with two types of curry. Otherwise one portion of flavored rice with veggie yogurts. Desert is almost always a cream biscuit.